Changes in North American energy markets over the past decade have strengthened the supply of transportation fuels, including motor gasoline, distillates, and jet fuel, in the Midwest and Rocky Mountain regions, according to a new study commissioned by EIA. The development of Canadian oil sands and the emergence of light, tight crude oil in the United States have provided refiners in the Midwest and Rocky Mountain regions with access to abundant, cost-advantaged crude oil supply and with opportunities to optimize crude slates and expand refinery capacity and utilization. Increased refinery production, combined with slowing demands for transportation fuels, has enabled suppliers in the Midwest and Rocky Mountain regions to reduce their dependence on transportation fuels supply from the Gulf Coast and has enhanced the redundancy and resiliency of their transportation fuels supply chains. 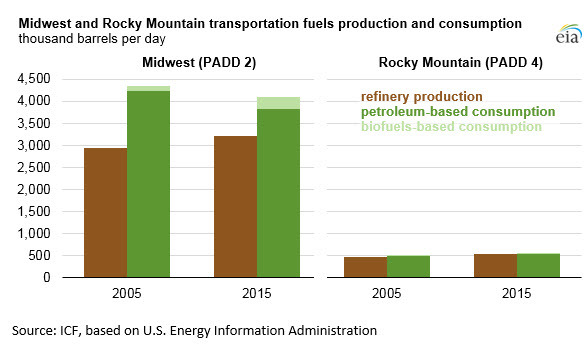 Refinery capacity and production of transportation fuels in the Midwest and Rocky Mountain regions grew significantly between 2005 and 2015, and fuels markets and supply chains in these regions have become increasingly self-sufficient. Meanwhile, demand for transportation fuels has been stagnant in the Midwest (but has grown in the Rocky Mountain region), while increasing volumes of renewable fuels—ethanol and biodiesel—have been added to the supply mix. As a result, in-region refinery production of transportation fuels used (net of ethanol and biodiesel inputs) in 2015 grew to 84% in the Midwest and 101% in the Rocky Mountain region, up from 69% and 97%, respectively, in 2005. This study is the third and final in a series of reports that examines supply, consumption, and distribution of gasoline, diesel fuel, and jet fuel across the United States. 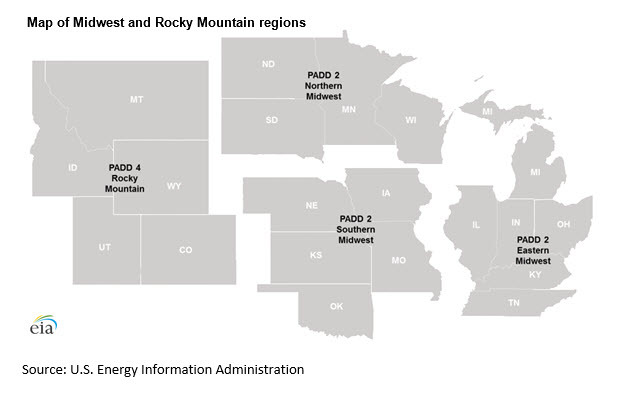 This study focuses on the Midwest and Rocky Mountain regions, corresponding to Petroleum Administration for Defense Districts (PADDs) 2 and 4. Previously published studies focused on the East and Gulf Coasts and the West Coast. This study examines transportation fuels supply, demand, and distribution at both the regional level and in three areas within the Midwest (which are referred to as sub-PADD regions in this analysis). The Midwest and the Rocky Mountain regions cover a large and diverse geography, and supply/demand balances and supply patterns vary within each region. Consequently, the Midwest has been divided into three regions: the Eastern Midwest region, which corresponds to EIA’s Indiana-Illinois-Kentucky refining district; the Northern Midwest region, which corresponds to EIA’s Minnesota-Wisconsin-North and South Dakota refining district; and the Southern Midwest region, which corresponds to EIA’s Oklahoma-Kansas-Missouri refining district. The Rocky Mountain region is not subdivided in this analysis. The study uses 2015 as a base year and takes into account expected changes in infrastructure and supply in subsequent years. Demand includes in-region consumption, movements of fuels to other regions of the United States, and exports to the global market. Supply includes in-region refinery production, receipt of fuels transferred from other U.S. regions and other Midwest and Rocky Mountain regional markets, and foreign imports. Distribution infrastructure includes storage terminals, pipelines, marine loading and unloading facilities, marine vessels, and rail facilities. This report completes a series of three studies that EIA has conducted to inform its analyses of petroleum product markets, especially during periods of supply disruption and market change.